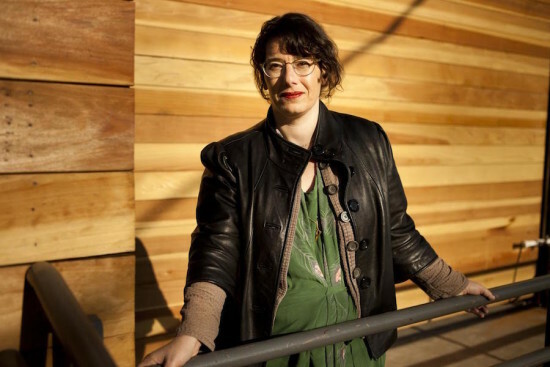 Landscape Architecture Magazine has given its annual Williams Medal to AN West Editor Mimi Zeiger for her article "Fresno v. Eckbo." Featured in LAM's December 2014 issue, Zeiger's piece centers on a redevelopment proposal for the Garrett Eckbo–designed Fulton Mall in downtown Fresno, California. The city government plans to run streets through the pedestrian-friendly landscape in an effort to revitalize this now struggling, once well-known city center. Zeiger's article draws attention to how the plan would jeopardize the preservation of the historically designed area. Zeiger’s piece is one of two articles chosen by a LAM committee that met the criteria of a subject taken into larger context in a compelling manner that provokes positive change, as stated in the American Society of Landscape Architect’s website. Annually awarded to two articles, one that has run in LAM and the other outside of LAM, the Bradford WIllliams award has recognized 34 individuals since 1979, making Zeiger the 35th awardee, leaving the 36th spot to someone yet to be announced. 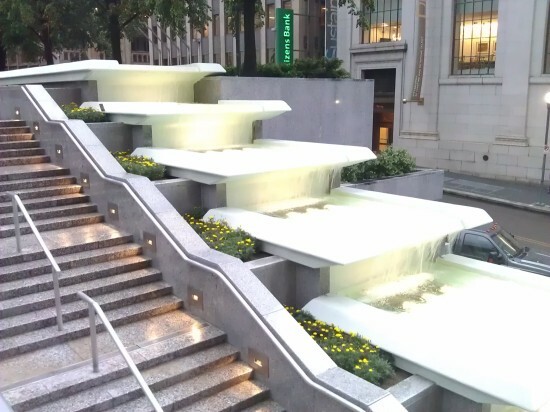 After five years and $10 million, Pittsburgh’s Mellon Square has been returned to its mid-century splendor. Dedicated in 1955, the Square served as a modern, green oasis in a city choked by pollution. But only a few decades after opening, the modern masterpiece had fallen into disrepair, its former glory hidden by cracked pavement, broken fountains, pigeons, and empty planters. As Pittsburgh has transformed itself in recent years, so to has Mellon Square. Now, the reborn space is yet another example of the Steel City's promising future. The park's original design is the work of Mitchell & Ritchey and Simonds & Simonds who created a conspicuously geometric space with prominent fountains, planters, benches, and triangle-patterned concrete. According to the American Society of Landscape Architects (ASLA), Mellon Square is the first park in America to be built on top of a parking garage. According to the ASLA's Dirt blog, “the intensive, compact Mellon Square design was layered, with three-dimensionally nested planes unfolding to a serene interior of skydome, sunlight, shimmering water, and native forest plants.” In 2008, the American Planning Association named Mellon Square one of its “great spaces.” At the time, though, the park was a dingy version of its former self. “Mellon Square had started to feel a little seedy and maybe even a little unsafe,” said the Pittsburgh Parks Conservancy in a video about the space. The renovation, led by Patricia O’Donnell of Heritage Landscapes, changed that. The pavement and fountains were restored, granite walls were cleaned and repointed, thousands of plantings were added, new lighting was installed, and a new terrace was created to expand the square's usable space by 15 percent. To keep the park from falling back into disrepair, $4 million has been secured to cover maintenance and upkeep costs. Above, the Pittsburgh Park Conservancy's video on the history and restoration of Mellon Square. 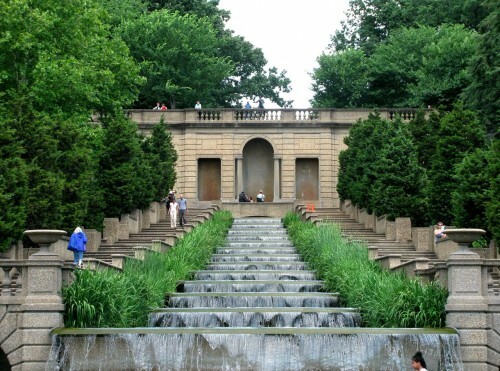 Discover the Landscape Architecture of Washington D.C. The National Building Museum's latest exhibit presents a new way to beat the summer heat—12 holes of mini-golf designed by prominent local architects, landscape architects, and developers. But if it’s windmills and castles you’re after, tee off elsewhere. While the course is a challenge, it offers an intriguing (and very engaging) look at Washington’s architectural history and future. 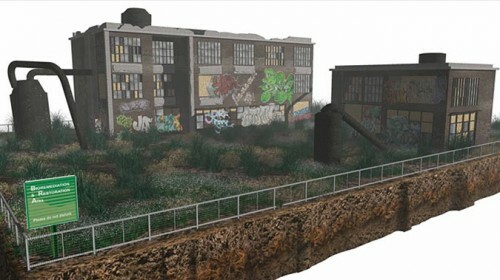 The first hole, Take Back the Streets!, is presented by the American Society of Landscape Architects and was designed by students of the Virginia Tech Washington-Alexandria Architecture Center. The team built a segment of streetscape with dedicated transit and bike lanes, and players must aim through pedestrians and stormwater management swales that function as traps. OLIN and STUDIOS Architecture created a hole based on their Canal Park project, set to open this fall near the Washington Navy Yard. Putters can aim up a ramp and through suspended cubes that mimic the development's pavilions, and if that proves too difficult, around PVC pipes representing trees to a separate hole. 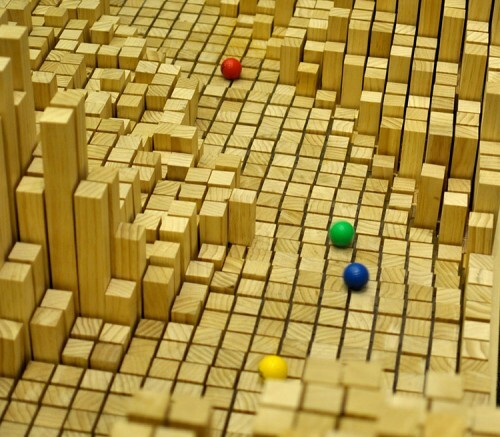 Ball on the Mall by E/L Studio forces players to navigate the iconic cartography of the National Mall. The design team used a CNC mill to map streets and cut grooves through which the golf ball travels. (You can blame l'Enfant for not making par on this one.) Slightly more abstract is Grizform Design's Hole in 1s and 0s, a representation of a smart phone's inner workings. Walls of the very three-dimensional hole are covered with lights and wires and ramps running down either side. Each forking ramp is made up of laminated laser-cut wood. Choose the right ramp and it's an easy hole-in-one, choose the other and you may spend some time chasing after your ball. (Or take a mulligan; we won't tell!) Skidmore, Owings and Merrill, biggest name of the lot, presents a pixelated topography of the Potomac and Anacostia basins titled Confluence. The team overlayed an image of Pierre l'Enfant's masterplan for Washington with a recent satellite image, extruding the pixels according to the density of development. Feel up to the challenge of navigating Washington with a golf club? Visit the National Building Museum anytime from now through September 3. A round of mini-golf is $5 per person, $3 with Museum ticket or membership. And don't forget to vote for your favorite design! Bioremediation involves using plants, fungi, or soil microbes to clean up toxic brownfields. Some types of deep-rooted plants can even be used to remove toxic metals from the soil. One example is Thlaspi Caerulescens, commonly known as Alpine Pennycress. According to Cornell University researchers, a normal plant can only store about 100 parts per million (ppm) zinc and 1 ppm cadmium. Thlaspi can store up to 30,000 ppm zinc and 1,500 ppm cadmium in its shoots without being negatively affected. In fact, these types of plants thrive while restoring the brownfield to its natural state. The line stretched down the block outside of the Center for Architecture last night for the release of High Performance Landscape Guidelines: 21st Century Parks for NYC. The document providing sustainable park guidelines was produced through a partnership between The Design Trust for Public Space and the Department of Parks and Recreation. The manual is the first of its kind in the nation. The crush at the door felt like a rock concert, though it was said that even David Byrne didn’t draw crowds this size when he appeared at the venue, nor, for that matter, did Zaha Hadid. “It’s like the Studio 54 of design,” quipped Park Commissioner Adrian Benepe by way of introduction. “People are killing themselves to get in here.” Don't worry; Not really! But It was very crowded. The report includes clear bullet-point guidelines for sustainable parks through their design, construction and maintenance. Besides outlining the benefits, which range from tree preservation to pest control, the report also walks the reader through site assessment and analysis. One major section delves into practices dividing that focus among soil, water, and vegetation. While the Trust and the City acknowledge that there will be a certain amount of redundancy for cross reference purposes, an attempt was made at a linear approach.Other cities are already expressing an interest in producing similar reports of their own. "Its an incredibly useful document that takes you step by step through new thinking about parks in a way that doesn't throw the baby out with the bathwater. There's a new [sustainability] layer, in addition to the beauty, history and culture." said Tricia Martin, president of the New York Chapter of the American Society of Landscape Architects. 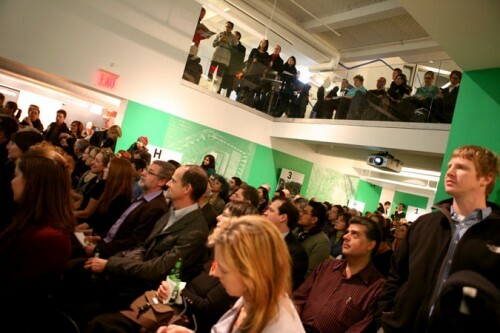 At the event, case studies from the book were presented, including Fort Totten in the Bronx designed by Nancy Owen Studio largely without reference to the guidelines. Asked if that project would have differed had the manual been available, Owen replied, “I think it would have been easier, because it’s all in one place and you’d just go down the check list.” “It’s a remarkable document in that it brings the institutional knowledge into one place,” said Linda Pollak, a landscape designer. Design Trust Executive Director Deborah Marton believes the sharing of information with the feet on the grass who actually maintain the parks will be integral for any current changes to survive into the future. “People will have to accept that places look sort of new and maintenance will have to be changed,” she said, referring to to less pristine manicuring of modern-day park aesthetics where what might look like weeds to the untrained eye could actually be filtration wetland to the trained eye. Marton added that the report notes that the old model of hiring seasonal workers at minimum wage to maintain parks over the course of the summer will need to be supplemented to include the hiring of year round specialists with training that’s on par with electricians or plumbers. “We have to make a commitment to these workers if we expect them to be committed to the landscape,” she said. And a crowd was on hand to show the will is there to get the process started.